Dr Arun Kashyap had his education from Lucknow University and Indian Institute of Science, Bangalore from where he did his PhD in the area of Polymer Science. He had a brief teaching and research assignment at BITS, Pilani for one year before he joined Indian Oil Corporation Limited IOCL (R&D Centre) in 1978. 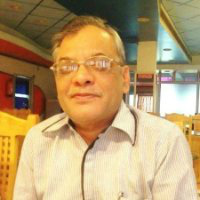 During his stay at IOCL, he had three distinct assignments in the technology areas of - Development of Rail Road Oils and Marine Oils on Component Approach Basis during 1978 to 1985, Setting up of Anionic Polymerization & Hydrogenation Laboratory; Developing Viscosity Index Improvers based on the Synthesis of (i) Linear and Star Isoprene Polymers & Copolymers by reactions such as anionic polymerization, block copolymerization and coupling reactions via bench top methodology followed by subsequent Hydrogenation, (ii) Olefin Copolymers by metallocene catalyzed polymerizations and Polymethacrylates by group transfer polymerization and their Laboratory Evaluation in the formulation of multigrade Automotive Oils during 1985 to 1994 and (iii) Laboratory Evaluation of Rheology Modifiers such as Pour Point Depressants, Drag Reducers, Wax Dispersants in the Pipeline Transportation of Crude Oils and Middle Distillates during 1995 to 2002. Dr Kashyap was asked to take up the assignment in the area of Intellectual Property Rights in the year 2002. Understanding & Integration of Various IP Processes to set up an IP Cell became his passion. He is recognized for his role in the Selection of IP Consortium for IOCL through the process of Global Expression of Interest followed by Tendering amongst shortlisted technically equivalent IP Consortiums..
At Crafitti Dr. Kashyap provides advisory services to our clients on intellectual property, setting up an IP cell, transforming enterprises into an IP led and IP focused enterprises.He can be reached at arun.kashyap@crafitti.com. .